For those of you lucky enough not to suffer from psoriasis, you are fortunate. For those that do, you know it can be not only irritating, but unsightly and embarrassing. To be clear, psoriasis is a rather common, non-contagious skin condition that can appear anywhere on your body. Patches of psoriasis may appear as a few small bumps, or it could affect a large area. Often itchy, skin can swell, become cracked and dry, and feel rather painful. 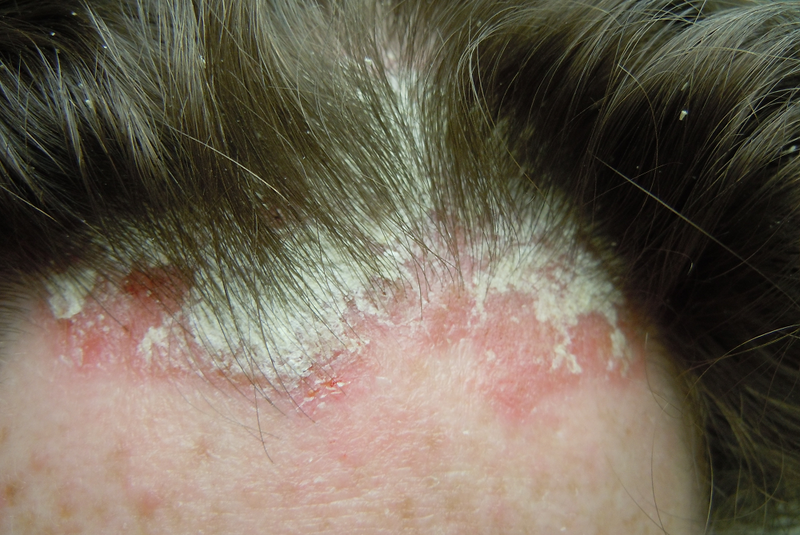 Having psoriasis in only one area is uncommon, and scalp psoriasis is very common for people who suffer from this condition. Scalp psoriasis can occur in a small area that goes almost unnoticed, or cover a large area, continuing down the neck and ears. Mild symptoms can include slight itching, bumps, or dandruff-like skin flakes. More severe cases can be much worse, with more scaling, larger and more bumps, and worse itching to the point of being painful. Scratching can be embarrassing and also lead to more problems, like skin irritation, loss of sleep from the irritation and itching, and even infections, which could lead to hair loss from continuous scratching. Scalp flaking can also be embarrassing and unsightly, and may even cause you to have to plan your wardrobe around your condition. If you think you have psoriasis, but are not sure, always check with a medical professional to get a correct diagnosis. Depending on the severity of your particular case, many products from mild to extra strength are available, and many are available without a prescription. Salicylic acid is a strong medication often used for callouses, warts and other skin maladies. It will cause the skin to peel, so if sensitive skin is a problem, you may want something milder. However, the end result has a very positive effect. Coal Tar is an anti-dandruff ingredient used in shampoos and other treatments and used for the scalp only. As any medication, always use as directed. Besides those two ingredients, natural and herbal shampoos may not have the desired results, but they do provide relief from the sore or itchy symptoms and are safer for those with allergies, sensitive skin, or other health and environmental concerns. Following are some of the best shampoo for your scalp if it’s suffering from psoriasis. This is a drugstore over-the-counter brand of shampoo you can get. It will help eliminate scalp itching, flaking and dryness, irritation and redness. It contains sulfates and as always you should check with ingredients in products in case of allergies or sensitivity. This is an excellent product for fighting irritation, itching, dandruff, scaling and redness. This product contains a coal tar solution which slows down the production of psoriasis skin cells. It won't weigh down your hair and has a pleasant herbal scent. Denorex is a maker of several very effective shampoos and treatments for scaling, dandruff, and psoriasis. Therapeutic Denorex Maximum Itch Dandruff Shampoo and Conditioner has one of the highest concentrations of coal tar and works very well. It will clear up flaking and itching and redness and help slow down the return of this ailment. It’s very strong so you could see best results after only a week of using it. Also by Denorex is Extra Strength Dandruff Shampoo and Conditioner. This product, like the one before, is a two-in-one shampoo and conditioner so you get maximum results with one product. It contains salicylic acid which is a proven ingredient for controlling flaking, itching, and redness. It removes the dead cells and stops the bad ones from coming back. The formula contains vitamin B5 for shine and healthy looking hair. This medicated shampoo is also very effective for treatment of psoriasis, itchy irritated scalp, redness, and dandruff. It contains coal tar to clear up irritation and slow down reoccurrences of psoriasis. Neutrogena T/Gel Therapeutic Shampoo Original Formula, Dandruff Treatment, 16 Fl. Oz. Neutrogena has a couple of special treatment shampoos called T/Gel. There is one for dandruff alone, or this one, T/Gel Therapeutic Shampoo- Original Formula. Dermatologist recommended, this shampoo will start working right away on not only dandruff but psoriasis to resolve scalp itching and flaking. It does contain coal tar, but it’s still gentle on hair and scalp. If dandruff is your problem, the T/Gel shampoo is a better choice for you. This company has several very effective products for treatment of psoriasis, like creams, conditioners, and this particular shampoo. It has maximum medication without a prescription. Zinc and vitamin B5 are a few of the ingredients that will ease the pain, itching, redness and flaking. It moisturizes your scalp to help prevent psoriasis from coming back. The formula is non-greasy, with no dyes or scent added. This is a very strong coal tar medicated shampoo, most effective for those suffering from a more severe case of scalp psoriasis. It contains a higher concentration of coal tar than most non-prescription medicated shampoos, and is highly effective for the treatment of psoriasis, eczema and dandruff. If you need to get to the problem quickly and effectively, this product will do the job. It works quickly with proven long term results. Because of its strength, always check you are not sensitive to any of the active ingredients. Since it is so highly effective, this product should clear up whatever the irritation is and prevent it from returning. This product works for scalp and skin, soothing the itch or burning sensation of dry scalp, psoriasis or other skin conditions. This can be used as a shampoo and face or body wash, greatly reducing the bumps, flaking skin, dandruff, or general dryness, sores and redness on scalp. It’s gentle, lightly scented, and can be used on color-treated hair. Gentle, natural organic ingredients like Manuka Honey (a powerful medicinal honey), aloe vera, citrus, and coconut oil are formulated with a 5.5 pH balance. This shampoo will soothe and clear away the dandruff and sore dry skin. It is safe even for a baby’s hair. This product is more gentle than some and may not be as effective as you need. It’s effective for less severe cases of inflammation. If you are just starting to solve your psoriasis problem this may be a good place to start, as it’s not as harsh as some of the heavier medicated treatments. This product can be used for total psoriasis treatment whereever it may appear on your body. Its medicinal ingredient is salicylic acid, however in a lower dose than some shampoos. It contains natural ingredients like aloe and carrot seed oil, and has a pleasant after smell like lemon. This will still relieve the symptoms of itchy, flaking scalp and redness, and overall scalp irritation. It’s a very gentle formula that may be more appropriate for milder cases or those with sensitive skin. This one contains no dyes, parabens, or artificial preservatives. The company has been making effective products for 65 years. If sensitive skin, allergies or bad reactions to certain types of chemicals or medications are a big problem for you, you may choose to take the natural route. There are many natural remedies, creams, oils, and natural shampoos available however none are medically proven to help with actual psoriasis. You may find something that works for you and manages to keep your symptoms at bay, which may be all you need and prove to be satisfactory for your needs. You may also need to consult a medical or naturopathic professional about alternative treatments. As medical professionals are not clear what causes psoriasis, finding a solution for your own personal issues may take some time and research. Perhaps a dermatologist will be able to provide some relief, or maybe you will find it in some of the products mentioned above. Of course, don't be disappointed if you don’t find the right one immediately. Something that works for you may not work for your friend or co-worker. Many factors can be at play and you may need to test several before finding one that works. Don’t be shy about asking for advice from friends or family. People may be suffering without you even knowing and also may know of a product that will work for you. This could save you time and money in the long run and help you find the shampoo you need to start solving your psoriasis problems today.